Roughly the size of a shoebox, the Mascot lander safely settled onto the surface of the Ryugu asteroid. It's seen here in an artist's rendering of the craft released by Germany's DLR aerospace agency. The Mascot lander floated down to the surface of an asteroid hurtling through space, capturing photographs and other data, according to the German Aerospace Center. The lander sent a photo of its descent — showing its own shadow on the asteroid's surface. The craft's Twitter feed echoed Alice in Wonderland, declaring: "And then I found myself in a place like no place on Earth. A land full of wonder, mystery and danger!" Roughly the size of a shoebox, the lander was released some 167 feet away from the rocky surface and descended in free fall, the agency said. 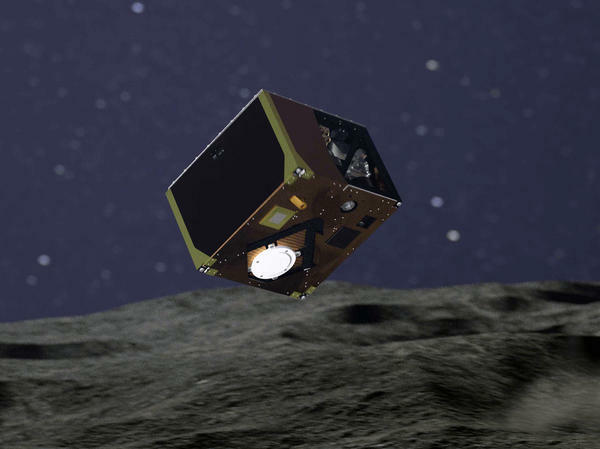 It had been carried by the Hayabusa2, the Japanese probe that is spending more than a year studying the Ryugu asteroid. "It could not have gone better," Mascot project manager Tra-Mi Ho said, in a statement from the German space agency DLR. "From the lander's telemetry, we were able to see that it separated from the mothercraft, and made contact with the asteroid surface approximately 20 minutes later." Mascot is powered by a lithium-ion battery that will allow some 16 hours of operation. It's the product of a collaboration between Germany's DLR and the French space agency CNES. The Mascot lander is carrying four main instruments. In addition to a camera and radiometer, it has an infrared spectrometer and a magnetometer — tools that researchers hope will bring insights about asteroids and the building blocks of the solar system. After deploying the lander, the Hayabusa2 spacecraft withdrew; it's now hovering about a mile and a half above the asteroid's surface, according to JAXA, the Japanese space agency. The asteroid is currently on the other side of the sun from Earth, more than 186 million miles away. Hayabusa2, which was launched in late 2014, is scheduled to return to Earth in 2020, carrying samples and data that were collected from the asteroid. As they celebrated the success of the Ryugu operation, the Japanese space agency and its German and French counterparts issued a joint statement outlining their next project: a mission to explore Phobos and Deimos, the moons of Mars, with the goal of bringing samples back to Earth.